A Year of Being Here: Jeanne Lohmann: "Questions Before Dark"
"Questions Before Dark" by Jeanne Lohmann. Text as published in The Light of Invisible Bodies (Daniel and Daniel Publishers, 2015). Art credit: "Floating Downstream...," pinhole photograph by Scott Speck. 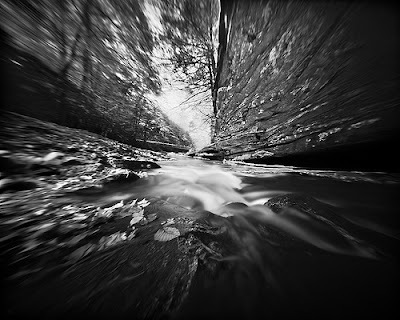 From the caption: "This is a 90 second 4x5 pinhole camera exposure, looking down a flowing stream in the Spruce Knob Recreation Area, in the Monongahela National Forest in West Virginia [USA].... The pinhole camera was placed about an inch above a rock amid the flowing water. It was a breezy day, so the trees overhead, in addition to being stretched near the frame edges, were moving. Lichens can be seen on the rocks on the cliff wall to the right."